The Abus Performance helmet (previously known as the Ecolution) is a curious beast. 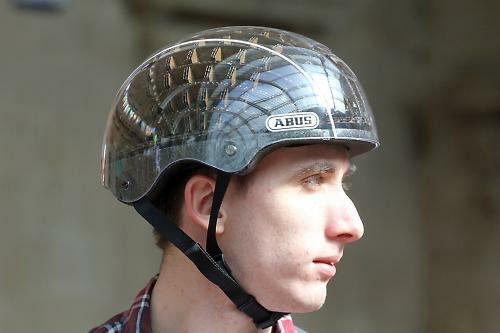 Abus claims its layer of cardboard makes it more shock-absorbing and therefore more protective than a conventional expanded polystyrene helmet. It has the rounded looks beloved of urban riders, clearly its target users. But its weight, lack of ventilation and some problem details swamp its appearance, and innovative technological and ecological features. We've talked about this helmet design before and again when it was shown at Eurobike at the end of 2012. The brainchild of Anirudha Rao, who now runs Kranium Headware Ltd in London, the Performance uses wood-cellulose fibre board as its main shock-absorbing material. 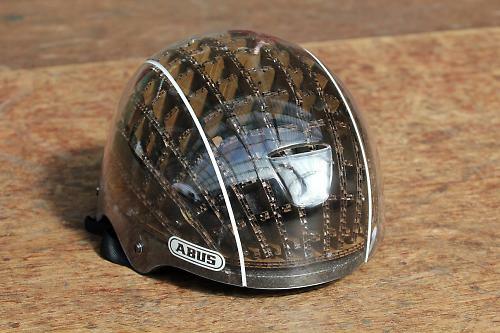 It was originally claimed to be three to four times better at absorbing shock that a conventional helmet, but Abus is now claiming an improvement of about 40 percent. The board is coated with acrylic to make it waterproof and there's a layer of recycled expanded polystyrene on the inside so the edges of the board don't get rammed into your skull if you hit your head. There's also a thick layer of plastic over the whole lot. It's quite similar to the construction of helmets in the 1980s and early '90s, which typically used an ABS plastic shell over their expanded polystrene cores. They were heavy compared to the polystyrene-only lids that followed them and that in turn begat today's helmets with thin co-moulded shells. You really notice the Performance's weight when you first pick it up and you can feel it from the moment you put it on. You're always aware of the extra mass. You feel it whenever you turn or lean your head. Taking it off is a blessing. Weight, then, is helmet's big problem. Even the heaviest first-generation helmet didn't match the Performance's 640g heft. Six hundred and forty grams. That's 130g heavier than the previous holder of the title of heaviest helmet we've tested, the folding Biologic Pango. It's twice the weight of a typical mid-price modern lid. It's over three times the weight of the 185g Specialized Prevail S-Works, the lightest helmet we've tested. Ventilation is also an issue. There are just two slots fore and aft for air to enter and leave, and there are no internal channels to conduct air over your head. At cruising speed in cool weather it's fine, but if it's warm or you're in a hurry things get sweaty quickly. I also didn't find the Performance very comfortable. It's the only helmet I've ever used where I couldn't get the rear of the fitting cradle to sit below my occipital protuberance with the helmet properly positioned on my head. The occipital protuberance is the lump on the back of your skull that most helmets use as an anchor point. The Performance's occipital cradle also houses an adjustment dial and I found the dial's housing dug in to my head unless I tilted the helmet back. The straps throw up another comfort problem. They're attached to the outside of the helmet, the best part of an inch away from your head. That means they only contact your head under the chin, concentrating pressure there. Most modern helmets mount the straps inside the helmet so they sit snugly against your head all the way to the buckle, spreading the load. The Performance has a pad over the buckle, which helps a bit but not enough. Abus deserves credit for trying something different, in using recycled or recyclable materials for the Performance, but the result is deeply flawed. Compared to similarly-priced conventional helmets it's very heavy, poorly ventilated and uncomfortable. You'd only choose the Performance if you were extremely taken with its looks. The transparent shell and consequently visible cardboard inner is very distinctive, and it'll probably be a great conversation-starter in urban cycling cafes. But for me its practical disadvantages far outweigh the small benefit of its looks and eco-friendliness. Can't fault it here, it's tidily made and all the moulded parts are clean. It meets CE shock-absorbtion standards, but in every respect - comfort, weight, ventilation - performance is poor. Hard-shell helmets have the big advantage of lasting years, as long as they're not crashed, because the outer shell protects the compressible liner. Between the weight, problems with straps and cradle, and lack of ventilation, it's just not comfortable for more than a few minutes' ride to the shops. The weight, lack of ventilation and comfort problems. The Performance has distinctive looks and innovative use of materials in its favour, plus various claims of improved protection over standard helmets. But none of that maters when the resulting helmet is so hot, heavy and uncomfortable that you'd never use it. 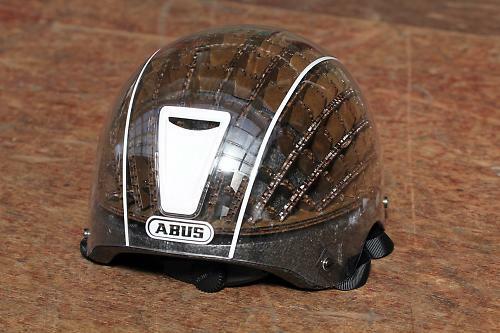 Abus and Kranium Headware need to go back to the drawing board and see if their ideas can be incorporated to a helmet that bears comparison with similarly-priced conventional helmets. 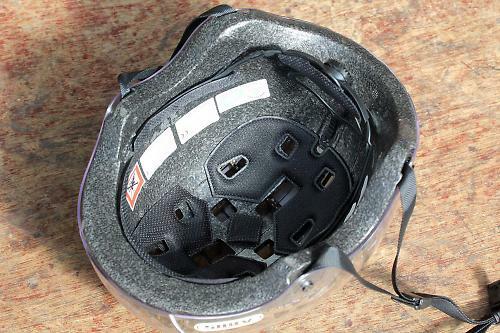 The only point that matters when reviewing a helmet; How protective is it ? If this lid makes a head injury less likely then that's good enough for me. Weight and venting are nice but you only have one head. Maybe protection is the most imprtant thing about a helmet, but if it is uncomfortable it won't be worn and it won't protect anything. Yes, but you've got lots of choice at helmets at £89.99 and below, so the other points made in the review are perfectly valid. That's why its called a "review". "Taking it off is a blessing." Don't understand why it wasn't given nil stars. you wear a full face motorsports helmet then, presumably? Having never been in an 'urban cycling café', the thought of the clientele having earnest discussions about helmets has left me with no wish to ever visit one. I presume this is a distinctly London based variety of refreshment venue? Or even just a full-face cycling helmet like downhillers wear? You don't see many road cyclists wearing these for some reason. I wonder why? "You only have one head." after all. Also I don't think I've ever seen anyone wearing a neck brace whilst road cycling. But "you only have one neck" and it is just as important as your head. Turns out most sensible people weigh up the risks and benefits of safety gear. So no, "How protective is it ?" is actually pretty far from the "only point that matters when reviewing a helmet". This helmet, plus my black assos 851 air jack will complete my hell raiser look quite nicely.